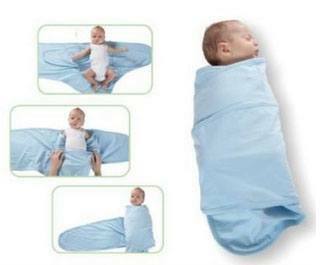 Be sure to see our reviews and ratings of the Top 5 Swaddling Blankets! Can swaddling help my baby sleep through the night? Yes! Most studies that have investigated sleep patterns with and without swaddling have concluded that swaddling above the waist leads to longer naps and longer overall amount of sleeping during the daytime. Babies who are swaddled generally have reduced startle responses during sleep, reduced motor activity during sleep, and lower heart rate variability (which means they are in a more stable state). Will swaddling overheat my baby? It can. Many people use swaddling to help keep their babies warm during naps and nighttime sleep. In fact, swaddling does keep your baby warmer during the night and help with temperature regulation. The risk, however, is that it is possible in warmer environments that swaddling may overheat your baby and lead to hyperthermia; this is especially risky when the baby's head is also covered (such as with a cap) or if the baby has a fever/infection. Should I swaddle when baby has a fever? Most doctors recommend that you do not swaddle your baby if he or she has a fever, even if it is a low fever. This can make sleeping difficult, however, as the baby is already uncomfortable and is now swaddled. Click here to see a website that provides a lot of suggestions on how to lower a fever, but also a suggestion on how you can swaddle a baby with a fever without overheating him or her. Will swaddling decrease the risk of SIDS? Yes! Most studies that have investigated SIDS risk with and without swaddling have concluded that swaddling reduces the risk of sudden infant deaths. Most researchers believe that one reason swaddling decreases SIDS risk is that it immobilizes the arms and makes it difficult for the baby to pull his/her beddling over the face and head (which can lead to overheating and/or asphyxiation). Another reason swaddling might decrease SIDS risk is that it is typically done while the baby is sleeping in supine position (on the back), which in and of itself is thought to decrease SIDS risk. Most also agree that you should never swaddle your baby while he or she is sleeping in prone position (on the tummy), which can increase SIDS risk. Can swaddling harm motor development? No! Most studies that have investigated motor development with and without swaddling have concluded that swaddling might have positive effects on motor development, especially in pre-term (premature) infants. There is no evidence that swaddling has short- or long-term consequences on motor development, or whether your baby can meet his or her motor milestones. Does swaddling affect breastfeeding and weight gain? No! While only a small handful of studies have examined these issues, they have found no strong evidence that swaddling can affect the duration or frequency of feeds or the total amount of milk that a baby consumes. Not surprisingly, given that swaddling does not appear to affect feeding behaviors, there is also no evidence that swaddling affects weight gain. Yes! There have been a number of studies that have examined whether swaddling can decrease the frequency and duration of crying, especially in babies who suffer from injury or illness upon birth. Most of the studies have compared whether swaddling can decrease crying more than massage techniques, and most show that compared to massage, swaddling can decrease crying by about 30%.